Who are Ruby Dee and the Snakehandlers? LITTLE BLACK HEART would be a fantastic album regardless, but with tight, catchy lyrics, it’s a testament to Ruby’s return to the level of musicianship she had to struggle to regain. Her smoky, expressive alto and the dynamic band lifts swing, rock n’ roll, R&B and rockabilly songs that cover everything from her accident to social commentary on certain music scenes to love gone wrong. The title track “Little Black Heart” is a classic old-fashioned minor-key murder ballad with steel guitar providing the spooky atmosphere. After nearly constant touring for the past 14 years, including thousands of dates across America, Europe and Australia, songs from the band’s fourth album, MILES FROM HOME (Dionysus Records, June 2008; produced by Conrad Uno), are still earning steady airplay, including “Cold Pines and Red Dirt,” which earned band front woman- lead vocalist and songwriter Ruby Dee- runner-up honors in Songwriter magazine’s 2007 competition. The album charted in at #86 on the AMA Top 100 for more than four weeks and #26 on the Texas Third Coast Music FAR Top 40. 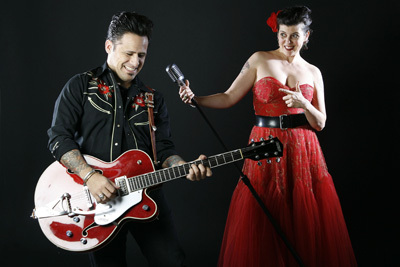 The “Round and Round” video, released in May 2009, has earned great acclaim with its cameos of Seattle rockabilly musicians and famous musical neighborhoods. And Gretsch-endorsed guitarist Jorge Harada has poured heart and sweat all over his Tennessee Rose guitar in such bands as The Spitfires and rockabilly giants DRAGSTRIP 77.